Deep within the Brazilian countryside rests a quiet, elegant loft home designed by Isabela Canaan Arquitetos Associados to reflect the beauty of its natural environs. This home presents an inventive concept, as it manages to blend elements of rustic and contemporary design within the expanse of an open, welcoming interior. Wood, white, stone and glass characterise the décor, with simple furnishings chosen so as not to overwhelm the space, as the true hero of the property is undoubtedly the stunning view streaming through its large windows. The soothing tones of green grass and flora fill the space, bouncing about the white walls and blending beautifully with wooden finishes and ceilings. Its open floorpan allows for the ultimate in relaxed, country living, with multiple vantages from which to enjoy the surrounding scenery included both inside and outside the home. All the necessities for modern living are featured, with a lovely kitchen combining stainless steel mod cons and wooden decor waiting to aid the preparation of country cuisine, and a simple, streamlined balcony providing a luxurious space on which to relax and indulge outdoors. Take a tour below and dream about a weekend in this serene, stylish country retreat! The facade of the home appears elegant and simple, with its geometric design broken only by the soft curve of the garden wall. 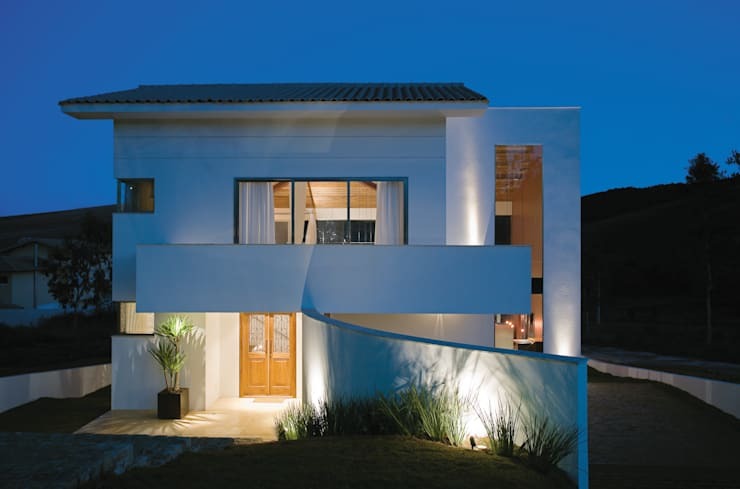 Its white exterior exudes a clean and contemporary allure within the Brazilian countryside, with a streamlined balcony jutting out proudly from the upper level, and the inventive elevation of a vertical window running up the right hand side of the home, lending insight into the expanse of its interior. Stone steps lead down a hill of manicured, green grass to the wooden tones of the front door, inviting entry and exploration. 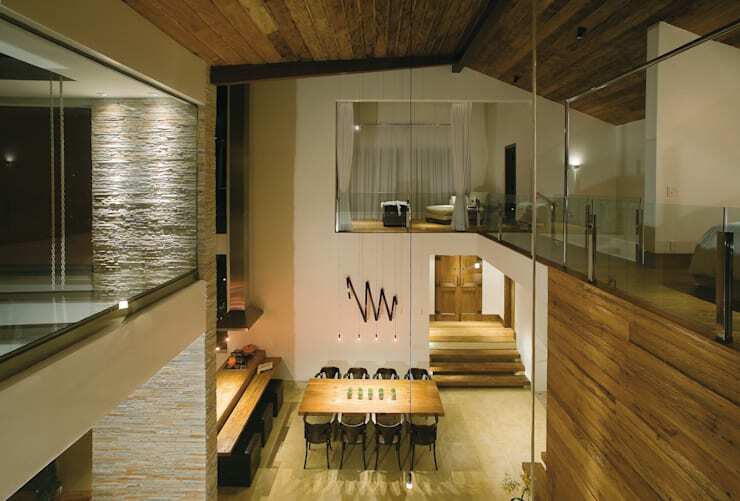 The interior of the loft presents a spectrum of pale, brown tones and textures, with compacted stone and wood favoured throughout the decor. Strong lines structure the space, with the rough surface of the stone pillar drawing the gaze up towards the lofty ceilings within the house, themselves finished with rustic, timber slats. The kitchen and dining furnishings have been carefully constructed. Their smooth finishes present functional and inviting surfaces on which to prepare and consume a delicious meal, while the living area has been decorated with a range of comfortable, contemporary lounges and armchairs. The whole space has been illuminated by a range of hanging lights, which dangle from the lofty ceiling, adding a subtly industrial feel to the home. The living space within the loft has been positioned to capitalise on its serene surrounds, with light streaming through large, elevated windows, bringing with it a gorgeous view of the countryside. Rolling hills and the casual allure of lilting flora fill the scene, with the colour scheme of the Brazilian biota wonderfully complementing the earthy tones found within the home. 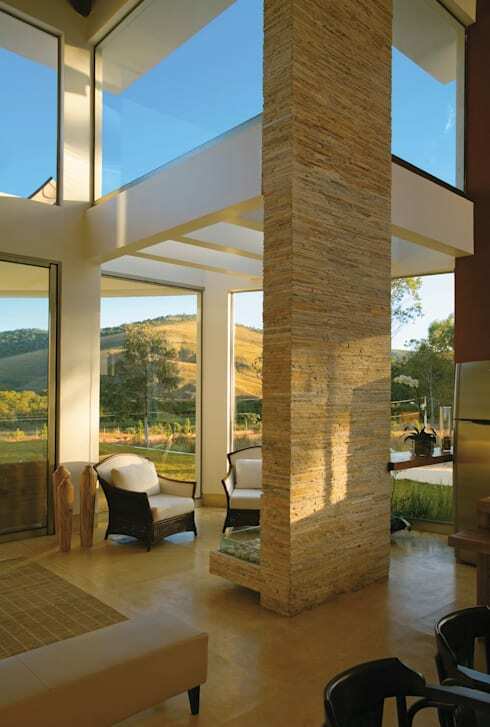 The beauty of nature is reflected right throughout the interior of this property, in the stone pillar seen here, the wooden finish of the furnishings and decorative artefacts and smooth stones showcased within a stationary, glass coffee table. From the upper level of the house we truly get a sense of the lofty expanse of its construction, with its white walls rising up two floors before being crowned by a rustic, wooden ceiling. The combination of wood, white and glass throughout the decor presents a inventive atmospheric amalgamation between rustic and contemporary design, with the home at once warm, welcoming and modern. Glass balustrades bordering the upper level reveal another open floor plan, with the simple furnishings of a master and guest bedroom perched atop smooth, wooden flooring. Facing the opposite direction and we're presented with a generous array of expansive windows which provide a lovely view of the surrounding countryside. A sleek balcony streams out from the rear of the home, and hosts a selection of simple, wooden deck chairs from which to admire the scene. Moving inside once again and we can see the elegant simplicity of the master bedroom, with a voluminous, white bed laying in welcoming solitude beneath the high crest of the rustic, wooden ceiling. Moving through to the home's exterior and we're stuck by the warm tones of green, blue and brown which stream into the space through its high windows. 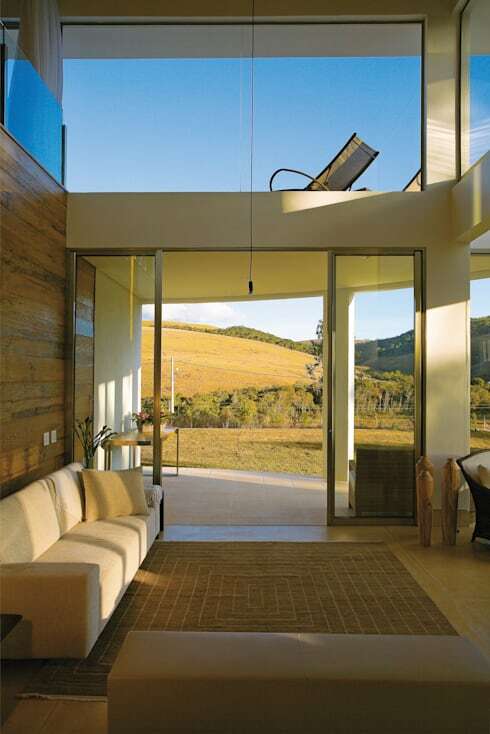 The house rests in contemporary serenity, constantly exchanging its modern aesthetic with an influx of country charm. The simple sofa pictured here waits quietly for occupants to come to relax and enjoy the home's natural surrounds, while the subtle geometric rug adds an element of contemporary sophistication. The horizontal lines of timber panelling elongate the space, adding a hint of rusticity within the modern design of the home. 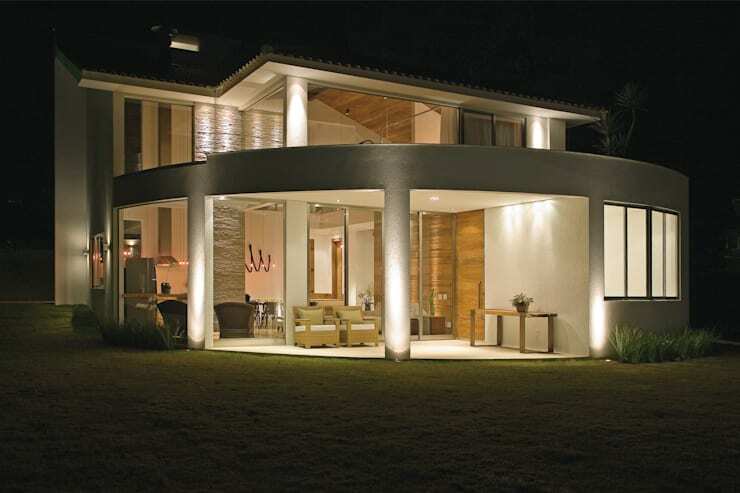 This view of the house displays its stunning, open design in the beauty of a Brazilian night. The cool, white curves of the rear façade appear calming and sophisticated in the light and shadow of their evening illumination. Hints of textured wood and stone peep out from the expansive living area, drawing us into this stunning and inventive design. Furnishings have been kept elegantly simple and homely, while the crimson glow of the hanging lamps adds a subtly industrial touch to the décor. For more ideas about incorporating unique materials within your home have a look at The House of Textures and Tones and get inspired! 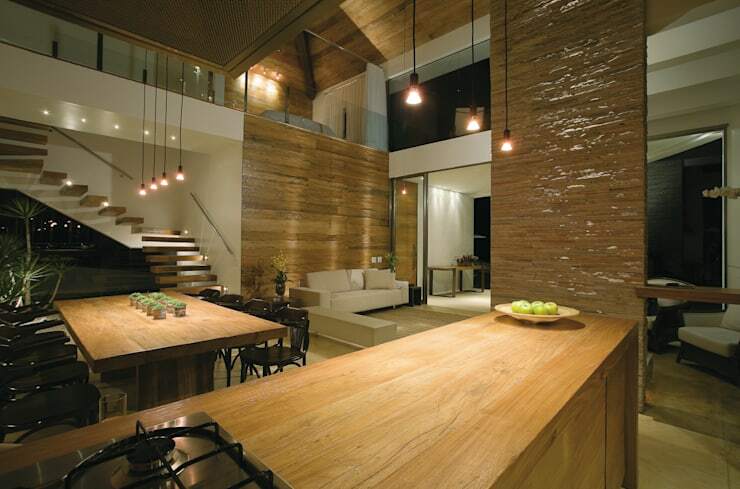 Do you like the combination of rustic and modern design seen in this home? Tell us your thoughts below.